When I write, I try to stay as close as possible to what I imagine being the theatrical experience in its practical aspect : people (actors) behaving now and in a space in front of people silently looking at and listening to them. I don’t really try to «say» anything about a subject-matter, but I try that each sentence makes something happen in the present. In this way, my plays work on a certain kind of humour, displaying ordinary situations (a walk in the countryside, people coming back home…) where strangeness comes from the fact that things don’t stop happening. Nicolas Doutey was born in 1982. 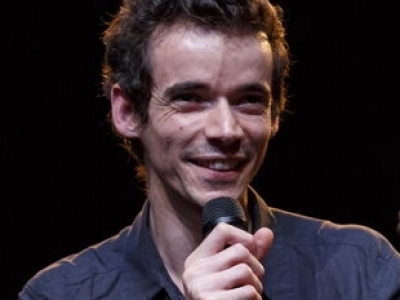 He writes plays since 2002, five of which are published by Éditions Théâtre Ouvert / Tapuscrit(Paris) : Je pars deuxfois and Jour (2013), L’IncroyableMatin, Théâtre et Amitié and Matins et Déplacements (2015). He is a founding member of the artistic journal [avant-poste], where he published translations of plays by Gertrude Stein, and interviews he realised with Jon Fosse, NoëlleRenaude, Michael Snow. Several stage directors worked on his plays : Alain Françon (Paris, 2011), Marc Lainé (Marseille, 2013), Adrien Dupuis-Hepner (Lyon, 2014), Linda Dušková (Czech translation, Prague, 2015) ; his last two plays, Jour and L’IncroyableMatin, will be staged in Théâtre Ouvert (Paris), directed by Rodolphe Congé, by autumn 2015. Two of his plays were broadcasted on France Culture (2012). He also participated in collective writing projects : Her in the Red Dress was written in English with Kyla Davis and ChloéDechery (Camden People Theatre, London, 2006) ; he was one of the five playwrights engaged in the writing of Notre Faust, staged by Robert Cantarella (Théâtre Ouvert, Paris, 2014). Since 2011, he works as an assisting director of stage director Alain Françon (on plays by Tchekhov, Beckett, Edward Bond, Michel Vinaver, PeterHandke). He is also engaged in research activities, published several papers on the field of performance philosophy, and earned a PhD on Beckett’s dramatic texts in 2012. As a co-director of a philosophy series in the publishing house « Les Solitaires Intempestifs », he edited several books on the philosophy of theatre. He also teaches dramaturgy in drama schools (ENSATT, Lyon ; La Manufacture, Lausanne). He received a bursary by the French Centre National du Livre for the play he is currently writing. Paul and Pauline live together and notice that something has changed but what is it ? It may be related to the dog that they would like to leave behind, or to their European friend who they will meet after taking the boat, or to a sound, or to a break-up. In any case, they should react in a precise place so that things be clear. It is cold in the clear light of the Northern island where Paul, Bodil and Donn are taking a walk. The landscape is weird and beautiful. But there is this killer wandering somewhere near the cliff. Or maybe there’s nobody there, but it’s frightening anyway. Anh has gone. Paul alone at home evaluates the space of the place and feels that something is going awry. And Bong is here, she doesn’t know Paul nor Anh, she doesn’t know why she is here (and she wonders why), and she is hungry. Paul tries to find out how to make things balanced again, in spite of Bong being here. Anh’s coming back, worried about the dinner to cook (friends are coming tonight), makes things even more complicated for Paul, who is trying his best.